She laughs it off, as funeral directors are not straight out of “The Addams Family.” They’re licensed men and increasingly, women, who meet all the needs of families when they have lost loved ones. 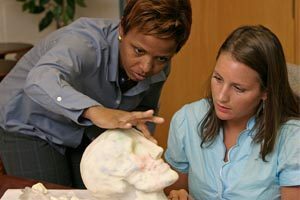 Jones teaches all the funeral service classes related to science – Microbiology for Funeral Service (FNS 125), Anatomy for Funeral Service (FNS 121) in addition to her favorite – Restorative Art I and II (211 and 212), which teaches techniques for restorations and recreations of facial features. Jones had a curiosity about funerals while at Norcom High School and often questioned a close friend whose family had its own funeral home. The limited answers only drove her to learn more on her own. She graduated from Old Dominion University with a bachelor’s in 1997 before completing her master’s in biology from the University of Maryland. Her initial plan was a career in pathology. “Then I realized I wasn’t as interested in the etiology of diseases as I was with disposition – what’s done after the fact to create that pleasant memory for the family,” she says. Jones earned her license in mortuary science from the University of the District of Columbia and moved back home to practice. During an internship at a Norfolk funeral home, she got to know Frank Walton, current program head for TCC’s Funeral Service Program. “Today my license still hangs in the Walton Funeral home in Virginia Beach,” she says. After taking education coursework at ODU, Jones worked as a middle school science teacher and as an adjunct professor at TCC in the biology department and at Norfolk State University’s funeral service program. When TCC started its own funeral service program, Jones transitioned to a full-time professor at the college, allowing her to practice what she preaches. Jones has a family of her own in Chesapeake. She and husband Rodney have two sons, Rodney Jr., 12, and Kole, 10. In her free time, Jones enjoys dancing to all kinds of music and weight training.